Home › Investing › How Much Are Mutual Fund Expense Ratio Costs? 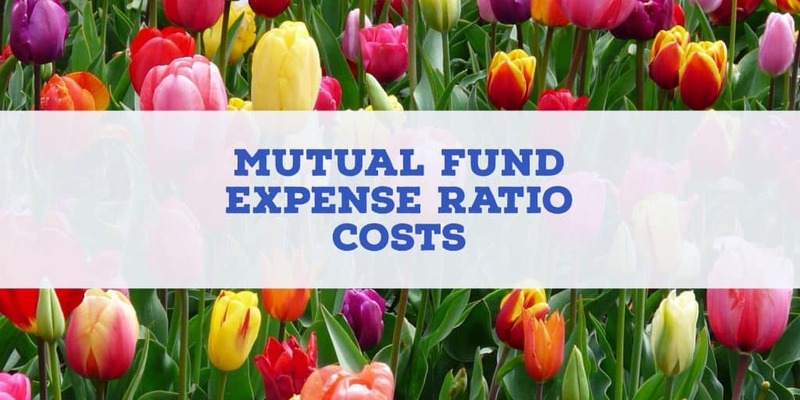 How Much Are Mutual Fund Expense Ratio Costs? Whether you are investing your savings in a self-managed brokerage account, a retirement account, such as a 401(k) or IRA, or via a robo-advisor, it is important to know how mutual fund expense ratios affect your portfolio value. Mutual fund expense ratio costs are not charged directly to mutual fund shareholders so the casual investor generally pays little attention to them but these costs can substantially erode portfolio returns over time. Every mutual fund will charge an expense ratio, so the fees cannot be avoided but you can ensure their impact on portfolio value is diminished by choosing funds with lower expense ratios. What Is A Mutual Fund Expense Ratio? Pro Tip: When comparing expense ratios of funds, be sure to examine funds in the same class. For example, compare mutual funds with small cap exposure to other small cap mutual funds. How Do I Find Out How Much Expense Ratios Cost? What Is The Impact Of Expense Ratios On Portfolio Value? What Other Fees Are Charged In Addition to Expense Ratios? A mutual fund expense ratio is an annual fee that all funds, including mutual funds and exchange-traded funds, charge to shareholders. These fund expenses are deducted annually and cover operating, management, administrative, and other asset-based costs. A mutual fund expense ratio is an annual fee charged to all mutual fund shareholders to cover the fund’s expenses. A mutual fund with a 1% expense ratio will cost you $100 annually for each $10,000 you invest. Mutual fund companies are subject to stringent compliance rules and have ongoing expenses to meet compliance standards, operate and manage the fund. The expense ratio is used to pay for other costs too, such as marketing, distribution, record-keeping and administrative. The good news as an investor is that mutual fund expense ratios have decreased over time, but you should still pay attention to them because a small percentage fee charged to your invested assets each year can add up to a large amount over time. On average, mutual fund expense ratios are higher than ETF expense ratios. Generally, mutual fund expense ratios tend to be higher than ETF (exchange-traded funds) expense ratios. Exchange-traded funds simply track an index, such as a commodity or bond index, whereas mutual funds are generally more actively managed by mutual fund managers, and so have higher expense ratios. Mutual funds and exchange-traded funds typically have fixed costs so funds with fewer assets often have higher expense ratios. For the most part, exchange-traded funds don’t charge expense ratios above 2.0% of assets, though mutual fund expense ratios can run higher. In general, you should aim to find funds with expense ratios below 1.0%. This is especially true if you are working with a traditional financial advisor as opposed to a robo-advisor because human financial advisors will generally charge an additional 1.0% or more to manage your assets. Quickly, you can see how fees add up to a large percentage of your assets. For example, if you squirrel away $500,000 for retirement and pay 2% annually to cover management fees to a financial advisor and mutual fund expense ratios, costs add up to $10,000 annually. If your portfolio is increasing quite a bit in value each year, those costs can be absorbed but when markets turn lower as they inevitably do from time to time, those fees can really hurt your bottom line. So how you can you lower the impact of fees? Robo-advisors will generally pass on expense ratios to clients but they usually select lower fee exchange-traded funds in portfolios and charge lower management fees than traditional financial advisors. For the hands-off investor who is not keen to manage their own portfolio, a robo-advisor is a good option to lower fees. Although most robo-advisors will pass on expense ratio costs, they generally use exchange-traded funds with lower expense ratios when constructing portfolios. Plus, robo-advisor management fees tend to be lower than those charged by traditional financial advisors. Among the lowest fee robo-advisors are Wealthfront, Ellevest and Betterment. Both offer free portfolio management up to the first $10,000 and both charge a management fee of 0.25% thereafter for basic services, which compares favorably to the 1%+ management fees charged by most human financial advisors. For accurate expense ratio comparisons, examine the charges of funds in the same category. For example, compare the expense ratios charged by a high-yield funds with the average charges of high-yield funds in the Investment Company Institute table below, and not with say an emerging market equities fund or a municipal bond fund. Each mutual fund has a prospectus that discloses the fees it charges. Major financial publications, such as the Wall Street Journal, also publish expense ratios. The average expense ratio paid by investors is called the asset-weighted average expense ratio because it gives more weight to larger funds in order to more accurately represent what investors pay. When you compare expense ratios of mutual funds, make sure not to compare actively-managed mutual fund expense ratios to passively-managed exchange-traded fund expense ratios. Actively managed mutual funds usually charge higher expense ratios. Similarly, it’s best to compare funds of the same category with each other, for example the expenses ratios charged by emerging market funds should be compared with each other not with a municipal bond fund. Small differences in expense ratio fees can seem unimportant but have a huge effect on your overall portfolio value over time. For example, the difference between a 0.50% and a 2.00% fee charge on a $100,000 portfolio that grows at 8% annually over 30 years is over $300,000. From the table below, you can see the impact of expense ratio fees on a $100,000 portfolio invested with an average annual gain of 8% over 30 years. The difference between a charge of 0.50% and a charge of 2.0% over that 30 year time frame is over $300,000 in portfolio value. So, while it’s easy to neglect small fee differences, the impact over time of just a small percentage fee change is a very large difference in your portfolio value. Most investors working with a traditional financial advisor will pay north of 1% in management fees. A good financial advisor will endeavor to select when possible mutual funds and exchange-traded funds with expense ratios less than 1% – typically these expense ratios are greater than 0.50%. For most investors who pay over 1% in management fees and somewhere between 0.50% and 1.0% in expense ratios, the total annual cost of fees will be in the 1.5% to 2.0% range. Portfolio growth over time experiences friction from these fees and hurts long-term portfolio value. For example, a $100,000 portfolio that incurs total fees of between 1.50% to 2.00% grows to a value of between $550,000 and $650,000 excluding taxes. Charles Schwab and Vanguard offer an extensive lineup of commission-free ETFs to clients. With increasing competition among brokers, the race to provide ever more commission-free exchange-traded funds has been a boon for customers. Charles Schwab and Vanguard offer the largest selection of commission-free exchange-traded funds. Schwab provides over 200 commission-free ETFs and Vanguard offers clients over 50 commission-free ETFs. The largest component of a mutual fund’s expense ratio is generally its management fee but 12b-1 fees that relate to the costs of marketing and distribution can run as high as 1% annually. If you have worked with a financial advisor in the past, you might have stumbled upon something called a 12b-1 fee. This fee also falls under the umbrella of expense ratio charges and is part of a mutual fund’s operating expenses. It is separate from any management fees charged and relates to the cost of marketing the fund. 12b-1 fees can run as high as 1% annually, and are generally divided among marketing and distribution expenses, and service fees. These 12b-1 fees and other fees that form the expense ratio are not broken out as a separate charge to mutual fund shareholders. Instead, expense ratios charged by a mutual funds are factored into its daily Net Asset Value (NAV). Sales charges are applied to some mutual funds. Depending on whether the sales charges are applied at purchase, sale or ongoing they are categorized as Class-A, Class-B or Class-C shares respectively. Other fees in addition to management fees and expense ratios can impact your portfolio’s performance. For example, brokers, financial planners and investment advisors are paid a commission called a sales charge when you invest in a mutual fund. Sales charges can be no higher than 8% by law but often range between 3-5%. Funds that have sales charges fall into three classes: A, B and C shares. The sales charge for Class-A shares is charged at the time you purchase a mutual fund and is called a front-end load. Class-B shares require payment of the sales charge when shares are sold. This is called a back-end load. An ongoing sales charge, which tends to be lower than Class-A or Class-B sales charges, is applied to Class-C shareholders on an ongoing basis.